Getting ready for back to school…..not long now. Just as well I have my new course ready to roll out on Moodle. 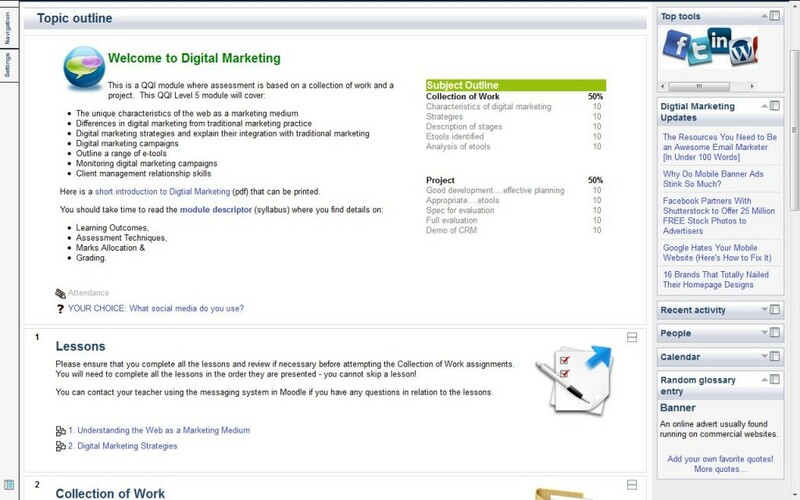 It is a QQI level 5 course in Digital Marketing. Search engines, email marketing, writing proposals, all the social media tools and the language of the digital marketing in the 21st century. Still a few finishing touches to the entire course but there is plenty of resources available to get everyone started on the subject. I have even followed some of my previous tips by embedding my Pinterest board for digital marketing. Hopefully it will be fun for the learners! The process of creating the course was faster given my past experiences of creating different courses. The adaptability of Moodle to facilitate different types of courses is giving me a lot of scope to work with in the future. This entry was posted by admin on August 24, 2013 at 6:11 pm, and is filed under Digital Marketing, Moodle. Follow any responses to this post through RSS 2.0. Responses are currently closed, but you can trackback from your own site.